At Covina Family Dental, we’re happy to offer custom-made dental crowns for patients suffering from serious tooth decay, cracks, cosmetic imperfections, weakened structure, or other similar flaws. We use the highest quality porcelain materials for a beautifully lifelike result here in Covina, CA. Contact us today to schedule your first appointment with Dr. Tran. Dental crowns are designed to rebuild the natural shape, size, durability, and aesthetic appearance of teeth that are imperfect in some way. They cover the entire visible structure (effectively “capping” it), which also protects what remains of the original tooth. Dr. Tran will help you decide which material is best for your customized dental crown based on your personal preferences and the location of the tooth. Possible options include dental porcelain, stainless steel, composite resin, and gold. In most cases, patients can expect to spend two visits at Covina Family Dental while receiving a new dental crown. During the first appointment, our team will start by capturing digital X-rays of the specific tooth or teeth. We want to inspect the tooth’s natural roots, any surrounding bone, and other details that will help us ensure the best fit possible for the crown. If we discover that the tooth is also suffering from advanced decay or an infection, root canal therapy may be recommended as an important step before the crown is placed. Next, Dr. Tran will numb the tooth and the gum tissue around it before making adjustments to its natural shape. Our goal is to file away enough enamel to accommodate the eventual placement of the crown. The changes we make will depend on the chosen material of the restoration – for instance, all-metal crowns tend to be thinner, which means we won’t need to remove as much of the natural structure. If significant portions of the natural tooth are missing, our team may instead build up the shape with quality filling materials. This will create all of the necessary surface space to support the patient’s brand-new crown. Then, it will be time to create a detailed impression of the patient’s tooth, which will be sent by our team to a trusted dental laboratory. A trained lab technician will craft the crown over a process that usually takes anywhere from two to three weeks. In the interim, the patient can expect to wear a temporary crown that will protect their tooth from harm and help them continue to live life as normal. When your new dental crown finally arrives at our Covina, CA practice, it will be time for the second appointment. Dr. Tran will start by removing your temporary crown. He will then carefully inspect the permanent dental crown, making sure that the shape, fit, and color is an optimal match. Once he is satisfied, it will be time to permanently cement the crown in place. You will leave that day with a smile that is stronger, healthier, and more attractive! If you are experiencing any of the following dental problems or concerns, be sure to let Dr. Tran know. It’s likely that a dental crown will correct the issue. How Do I Care For My Dental Crown at Home? When you’re wearing a temporary dental crown, it’s important to exercise caution when eating foods that are overly chewy, like gum or caramel. We also strongly recommend that you avoid hard foods that may hurt or dislodge the temporary, such as raw vegetables. Please try to chew on the side of the mouth that does NOT have the temporary crown in place. Covina Family Dental will provide a comprehensive list of instructions to ensure a smooth, successful wait for your permanent crown. Once you have a permanent dental crown securely in place, it can be treated like a normal tooth for the most part. 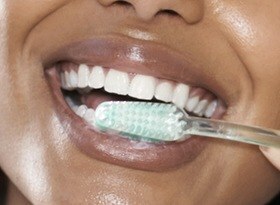 Brush twice a day, floss once a day, and rinse regularly with an antibacterial mouthwash. As long as the patient practices regular oral hygiene and doesn’t suffer from habitual teeth grinding/clenching, their new restoration should last for 5-15 years or even longer. Please contact us today to learn more about this high-quality service in Covina, CA by phone or through our online form.